Pomelos are very popular during Chinese New Year because the Chinese word for pomelo sounds like “to have.” It is also used as a decoration in people’s homes and symbolizes “family unity.” It is a large citrus fruit, native to southeast Asia, and tastes kind of like a mild grapefruit. Great for eating fresh, I like to score the peel in quarters, peel it off, then separate the sections, peel the membranes off, and enjoy the fruit! I’ve read that it is good sprinkled with salt, but I haven’t tried that. It has a very thick skin which can be dried and used, often candied or made into marmalade. I remember on one of our trips in China, we saw a fence full of pomelo peels hanging to dry. I enjoy a Korean tea made from pomelo peels (another picture some day!). The fruit is also made into a paste for cooking. I paid 7.80rmb, or $1.20usd for the pomelo pictured, we used it with breakfast two days and still had some for snacking. 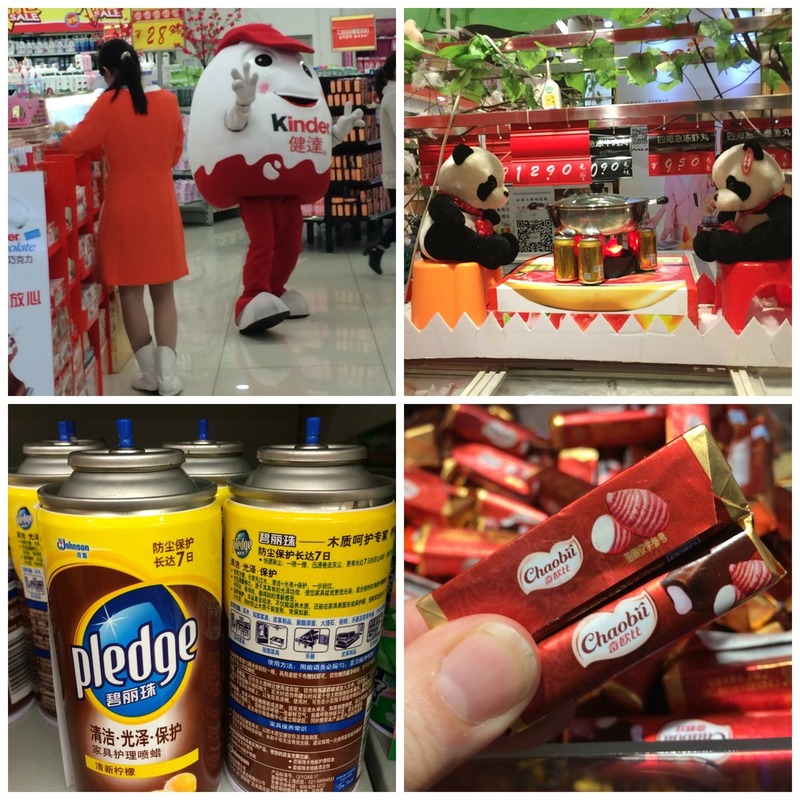 Life in China: A Picture a Day 2016, Feb 13 - Saturday Night at the supermarket…. A giant live Kinder egg, pandas having hot pot, furniture polish without the spray cap (we had to go to customer service and have them get it and put it on? ), and chocolate covered taro candy …. there’s ALWAYS something new to find when grocery shopping in China! Life in China: A Picture a Day 2016, Feb 1 - How many years have I been looking at this in the markets and didn’t know what it was???? Well, I finally learned! Most commonly, it is called “celtuce” or “stem lettuce,” and “wosun” 莴笋 in Chinese. It is also called "asparagus lettuce". I learned that the thick stems are peeled and then sliced or chopped for stir-fries (or steamed), and the leaves are good for soups. So, we did just that! A stir fry with pork, mushrooms, and celtuce, turned out very good… celtuce has a mild taste, somewhat like celery (I didn’t think it tasted like asparagus like some said), and it kept a nice firm, crispy texture. We added the leaves into vegetable beef soup, and although I can’t say they added much flavor, they added a nice dark green color. I read that they can be bitter. Supposedly, the young stems and leaves can also be used raw in salads. Found in most (southern) Chinese stores/markets with produce (not sure about other areas?). For those of you outside of China, check your Asian markets!